Earlier this week I visited a state park in Malibu, CA during my day off. Since moving to California I have learned to appreciate a new form of beauty in nature, and a winter which the none of the fierceness of my previous New England home. As usual, I came loaded with camera equipment but could not bring myself to take an image of the many places destroyed by the recent fires which ravaged the area before Christmas. What is astonishing is how quickly nature brings everything back to life. So what was a blackened landscape only a few weeks ago, has an emerald green to it that Ireland would be proud to own. My days off here are precious, so I like to go somewhere where I can commune with nature. This past week I went to Point Dume, a California nature reserve. After a long climb down the cliff steps and pathways (much of which had been washed away by recent rains), I made it to the beach. The colors of the beach rocks and pebbles were a wonderous color, making everything fall into a giant jigsaw. As I turned around on the beach from the stairway, I suddenly noticed a presence right by my feet. A seal as shown in the photo below. The fact I was right next door and the seal did not disturb me was a visible flag to a problem. The seal was in distress and not able to move anything except his head. So I stayed with him to see if he was perhaps just having an afternoon nap, or something more serious was up. Turns out he was injured and after a discussion with two other beachcombers who arrived on the scene, we called the California wildlife rescue. They arrived on the scene very quickly but were only equipped with a couple of fishing nets but they managed to secure the seal in one of them and they carried him up the stairway and cliff face. A not inconsiderable feat! While they were obviously doing their job, it was so wonderful to see the care they took to ensure the seal was not made more uncomfortable despite this inevitable handling of him. His wounds become evident as they moved him with much compassion and attention. 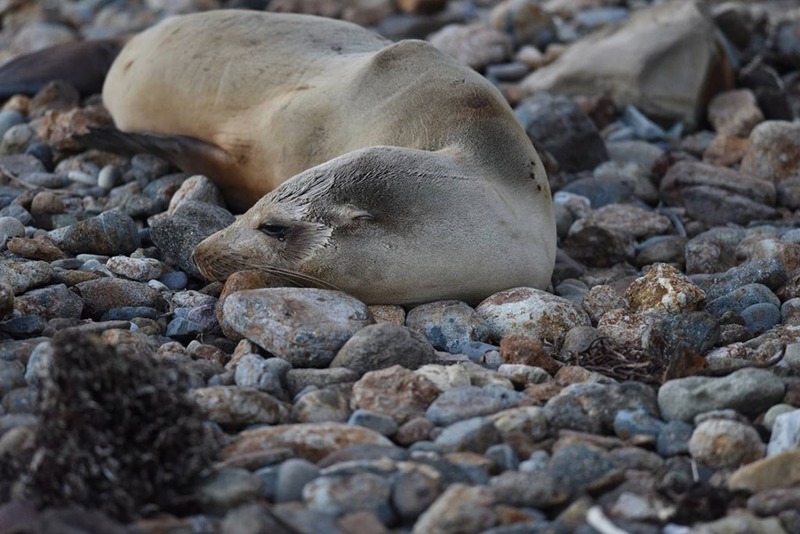 By then, more bystanders had come to help, bringing equipment and helping load the mammal into the truck on his way to the California sealife veterinary center nearby. Yet another week in which unconditional love is expressed in action. An instant community of care built around an animal who might have died on the beach otherwise. Just another reminder of God is in all of us … all the time. Displaying your suffering, which now was clear. Safe from an incoming but drowning tide. Like a tide which washed me in. And carried you up the cliff face stairs.